4 groups of 7-8 years old kids (aprox 8-9 children per group), from the close by Kaijonharjun nuorisotalo came to know a little bit more of Fab Lab. Kaijonharjun nuorisotalo organize after school activities for small kids. This time we wanted that they learn some basic principles of electronics but at the same time they had to build something with their own hands. We propose them to build their own city consisting of two buildings and a garage. The two buiildings had their own lighting (one of them, automatically turned on when there was no light). In addition, we had a fan in between both of them. Finally, the garage and its car made their own sound when they were touched. To generate the sound we utilized Bare Conductive' Touch Board. 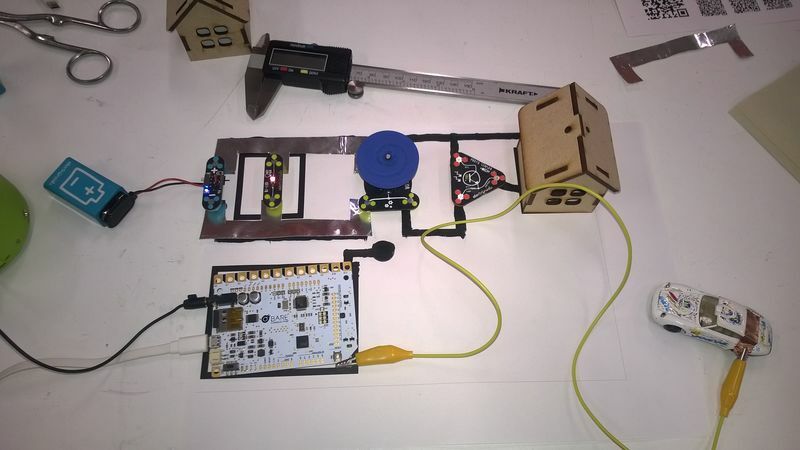 This board turn touch into sound and make any surface interactive. We stored two different sound in the Touch Board SD card. Two terminals of the Touch board were connected to a toy car and to the garage door through crocodrile pin connector . When the car or the garage door is touched, the Touch Board plays the associated sound. To connect the different circuitscribe modules we utilized electronic paint instead of cables. We presented Fab Lab to the kids. We show some of the robots and gadgets other kids built previously. We cut with the kids the pieces to build the houses. They collaborate, for instance, pressing the start button. We let them freedom to play with the different components.